You configure the accounts Watcher uses to communicate with PagerDuty in the watcher.actions.pagerduty.service namespace in elasticsearch.yml. Log in to pagerduty.com as an account administrator and go to Configuration > API Access. Enter a description for the key and click Create Key. 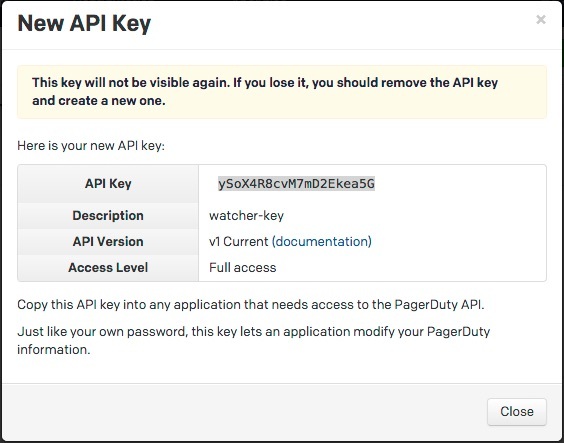 Watcher supports v1 PagerDuty API keys. 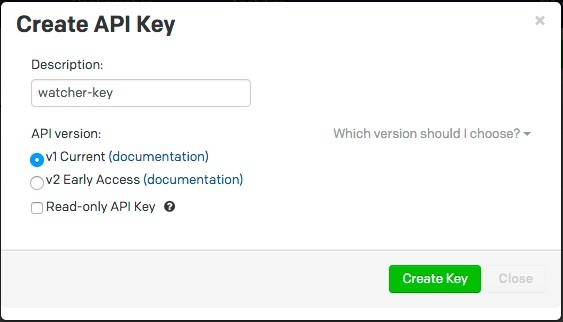 Copy and store the key before you close the New API Key dialog. You can also specify defaults for the PagerDuty event attributes: . If you configure multiple PagerDuty accounts, you either need to set a default account or specify which account the event should be sent with in the pagerduty action.